Save time and money with our specialized pricing and services for contractors and building professionals. We offer pickup and delivery 7 days a week, so we're always on your schedule. We understand that as a professional you’re busy. Our construction dumpsters will be delivered and picked up on-time, on your schedule. Keep your employees on the jobsite and reduce liability with a construction dumpster rental. We offer pickup and delivery from 8AM-4PM 6 days of the week in order to provide you with the highest level of flexibility. Our special contractor pricing helps keep more money in your pocket, and gives you more time to focus on your business. Maintaining a professional appearance on the jobsite is an important part of establishing trust for construction companies and contractors. We understand that, and that’s why a rental dumpster from Happy Little Dumpsters will always show up clean and well maintained. No rusted, beat up looking dumpsters here. Construction companies, contractors, and other professional service businesses are eligible for special contractor pricing. This pricing plan charges an up-front flat rate for the dumpster. We then invoice you for final actual landfill fees. Please fill out the contractor pricing request form above for instant access to our contractor pricing. We know space is limited on the jobsite, and our dumpsters were designed with this in mind. At only 12 feet long, our 20 yard dumpster takes up about the same real estate as a 4 door sedan. 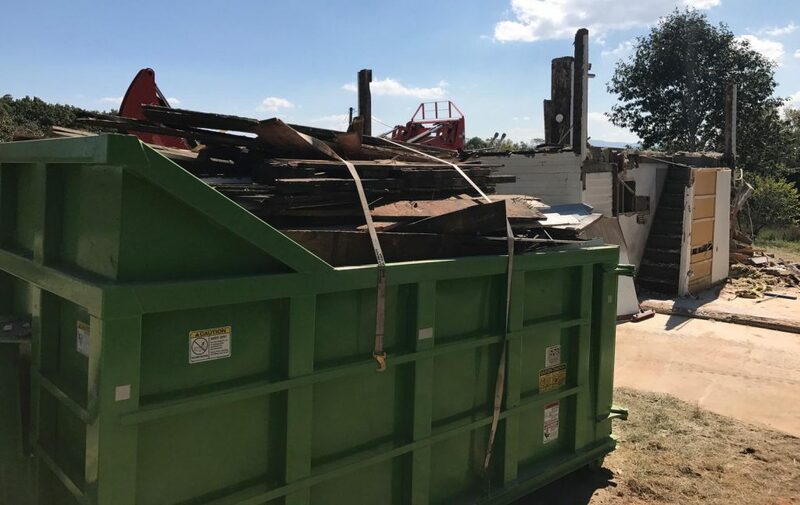 The double door design of our dumpsters means that you’ll only need about 4 feet of clearance around the back of the dumpster to swing open the doors. If your project is projected to last longer than our normal 7 day rental period we offer long-term and permanent dumpster rental options. You can choose weekly or bi-weekly dumpster pickup based on the needs of your project. When we pick up the full dumpster we leave a clean, empty dumpster so you don’t lose time waiting on the dumpster to return from the landfill.